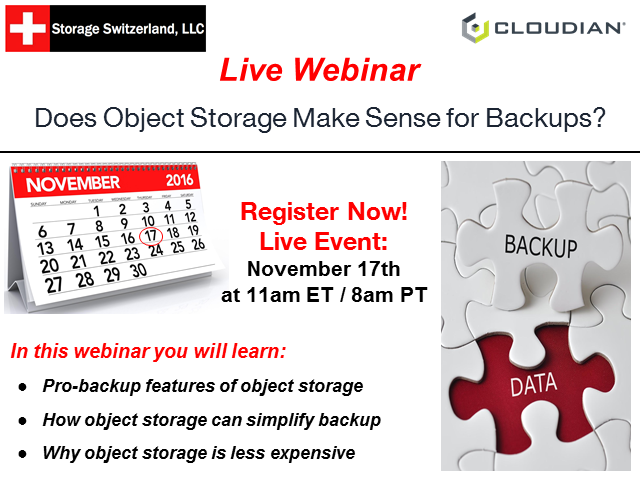 Does Object Storage Make Sense for Backups? Everyone understands disk has become the primary target for backups in the last several years. It’s also safe to say that the main type of disk storage used as a target for backups would be a purpose-built backup appliance that presents itself to the backup application as an NFS or SMB server and then deduplicates any backups stored on it. But what about object storage? Object storage vendors tout that their systems are less expensive to buy and less expensive to operate than traditional disk arrays and NAS appliances. So, does it make sense to use them for backups? How much is deduplication a factor and is deduplication even available with object storage? What else can object storage bring to the table that traditional disk backup appliances can’t? Title: Does Object Storage Make Sense for Backups?